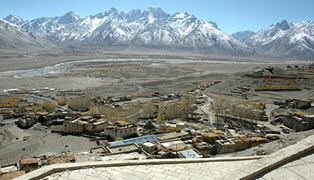 Zangskar valley lies to the south west of Leh, surrounded by the Himalayan and Zangskar ranges. 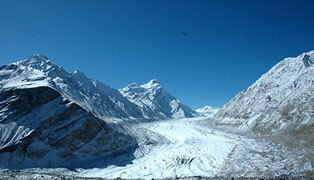 It is the most isolated of all the trans- Himalayan valleys. Zangskar comprises two main valleys of Stod (Doda chu) and Lunak (Tsarab chu), which converge below at Padum. The valley has an area of about 5,000 sq kms and is situated at an elevation of 13,154 ft. The area remains inaccessible for nearly 7 months in the year. As winter approaches all the high passes get closed and the river freeze on the surface. Zanskaris walk along the frozen river to reach the Indus River in Nimoo village, which is known as the Chadar trek. The route from Kargil to Padum via Penzi La is the only motorable road to reach Zangskar valley, which remains open from June to September. The Kargil to Padum Road was completed in the late 70’s. This road is not metalled and has been neglected by Govt. Localities of the region are trying to get the construction of Chadar road started running from Nimo to Padum, which would be the shortest route if constructed. 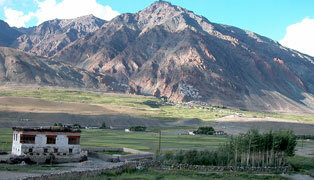 Padum is the sub-tehsil of Zangskar which is 464 kms from Leh and 234 kms from Kargil. Once the Capital of the Zangskar valley, today it is the administrative headquarter of the region and probably the most populous settlement of Zangskar. There is a small market along the main road with hotels, restaurants and number of shops. The town has a newly constructed mosque and a recently formed Muslim community. Stakrimo Gonpa on a hill side and the 10th century monument carved on a huge rock near the river bank provides epigraphic evidence that the region was influenced by Buddhism since ancient period. The main attractions in Zangskar are the ancient Buddhist monasteries like Zongkhul, Bardan, Stongde, Karsha, Phuktal and Sunni Palace. The beauty of these monasteries is beyond description and most of the monasteries can be visited in a day or two by Jeep from Padum. Padum is the head quarter of Zanskar Valley and it provides Hotels, Guest Houses and couple of restaurants. 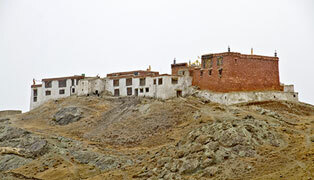 Jeep is available for the sightseeing of nearby monasteries.